"A unique salad that will become a favorite of your family and friends." In a skillet over low heat, melt the butter or margarine; add the almonds and sesame seeds. Cook until lightly toasted. 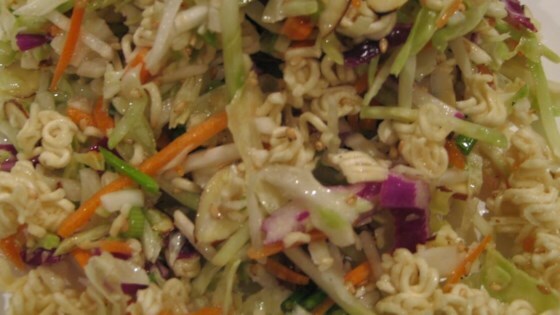 In a large bowl, combine the cabbage, onions, almonds, sesame seeds and broken uncooked ramen noodles. Wisk together the oil, sugar, vinegar, pepper and salt. Pour over salad, toss, and serve. this recipe is wonderful, but using a bag of brocolli coleslaw mix, instead of shredded cabbage makes it even better! This is a WONDERFUL salad!!! Don't change a thing, you won't be disappointed. This is my new favorite for the upcoming summer. Thank you Angie!! This salad is awesome! I have been looking for the right cabbage salad for a long time...there are so many out there. The dressing is sweet and the vinegar does not overpower it. So good!